Life on the frontier is one adventure after another for twelve-year-old Hattie Marshall. 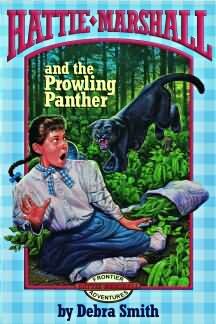 She enjoys the excitement, but sometimes things get scary, like when she gets swept away on a flooded river and has to save herself, or when a black panther keeps coming to her family’s farm, hunting for its next meal. Meanwhile, things are changing at home. Her sister is getting married, Gramma needs extra help, and worst of all, her brother and best friend, Sam, is leaving on a cattle drive that will take him away from home for several months. It all begins to seem like more than she can handle. But Hattie will soon find that some things don’t ever change—like the love between a brother and sister, and the fact that God is with her, even when she’s lonely and her world seems upside down. Debra Smith has been named to the Louisiana State Artist Roster in recognition of her excellent school and library presentations about local history and culture. A member of the Society of Children’s Book Writers and Illustrators, she is also the author of Pelican’s Hattie Marshall and the Hurricane, Hattie Marshall and the Dangerous Fire, Young Heroes of the Confederacy, and Yankees on the Doorstep: The Story of Sarah Morgan.